“Together we can transform our communities and change lives” was the message at the Get Vocal Celebration Event and Book Launch which took place this week in the Mansion House, Dublin. Speaking at the event Helen Campbell, Head of Civic Engagement and Lifelong Learning at Age & Opportunity, reflected on the changing culture for older people in Ireland, “This is an exciting time to be growing older in Ireland, for the first time in history we can be a part of a new vision of ageing. Together we can create a new old.” The book “Finding our Voices, Making a Difference”, launched by Tom Costello from The Atlantic Philanthropies, which includes interviews and stories from those who took part in Get Vocal, is a testament to that fact. The aims of the project supported by Get Vocal were to build the capacity of the Co. Wicklow Network for Older People to be a powerful and effective voice for older people in the county; to build the structures necessary to identify, research and create a mandate to take action on issues adversely affecting older people; and to promote a positive attitude to ageing. The Network held seminars on topics such as the positive ageing strategy and has made representations to government departments, public bodies, local and national representatives on issues such as community supports, respite services, transport and on rights. The Network has established a ‘Volunteer Ambassador’ initiative, encouraging older people to support and to act as ambassadors for the Network, ensuring the voices of all older people in Co. Wicklow are heard. 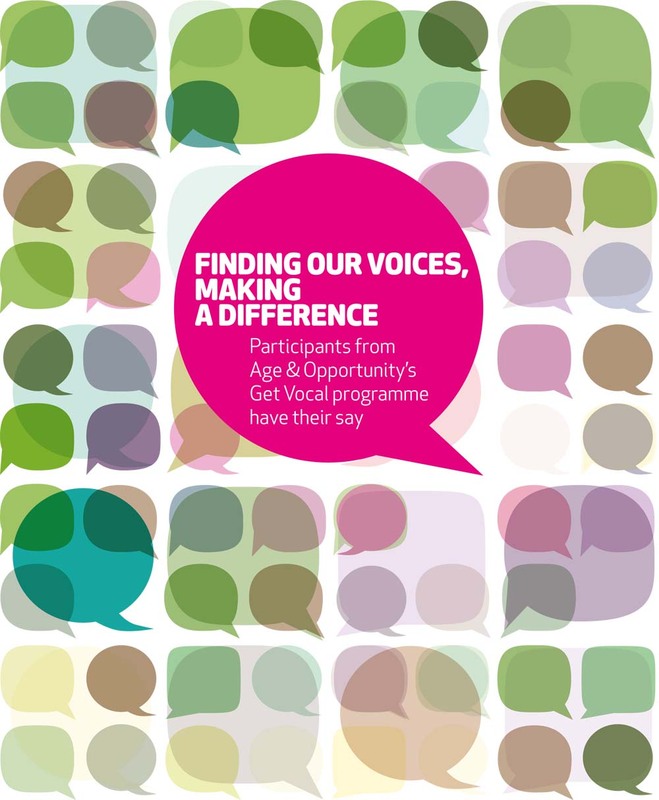 Get Vocal was Age & Opportunity’s programme that sought to support and develop grassroots work across the country, empowering older people to make change in their communities. Over the course of six years 36 grantees across the country received 1.6 million euro in funding and practical support from Age & Opportunity. This event, which celebrates the culmination of six years’ work, from 2008 to 2013, has gathered together over 60 key people who were part of those achievements. “Through the work of Get Vocal we now have a body of learning and reflection about the particular challenges of advocacy facing older people and the organisations and groups who support them locally and nationally. A huge amount of credit goes to Age & Opportunity for putting grass-roots advocacy among older people on the map starting in 2008” said Tom Costello from The Atlantic Philanthropies’. At the event Ita Mangan, Chair of the Board of Age & Opportunity, expressed her sincere thanks to The Atlantic Philanthropies for supporting the programme.